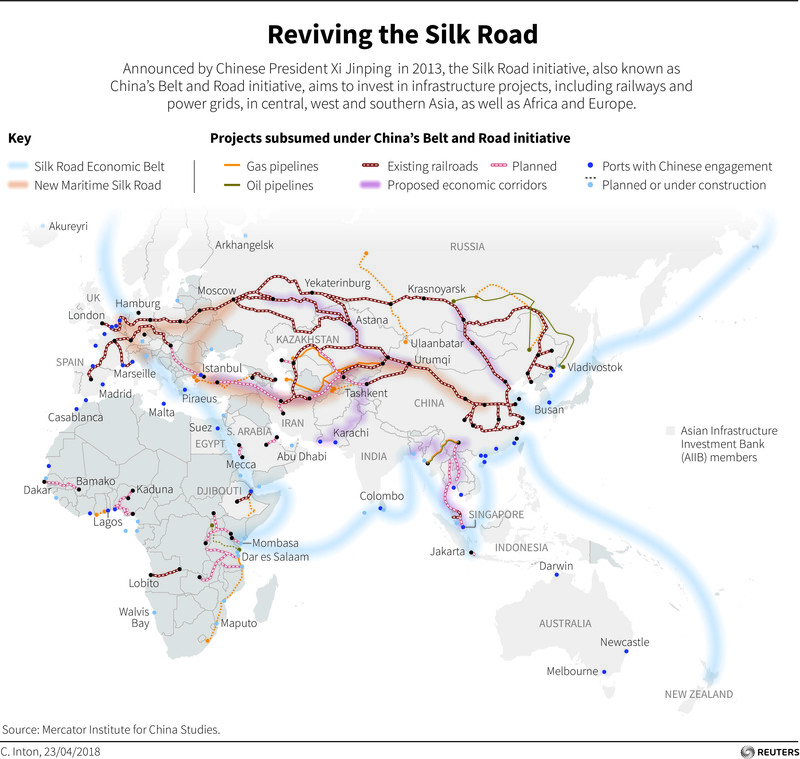 Can the project bring green transformation to the countries that sit along the New Silk Road? While the BRI is generally viewed as an opportunity to address the infrastructure gap and boost economic growth, it is not without controversy. China is the largest emitter of greenhouse gases in the world, responsible for 30% of global carbon emissions. It has an abundance of surplus industrial capacity, some of which is polluting and of high energy intensity. Meanwhile, some projects with Chinese investments in the Belt and Road region have exposed themselves to environmental risks and raised concerns by international media and NGOs. On the other hand, China has also been a leader in renewable energy investment, accounting for 36%, 40% and 36% of the world’s total investment in hydro, wind and solar respectively. It also plans to invest $360 billion more into renewables from 2017-2020. China is making leaps and bounds in technological innovation, spending $408.8 billion on research and development in 2015, surpassing the European Union and catching up with the US. China has played a very constructive role in the fight against climate change since the US withdrew from the Paris Agreement, and its corporations are increasingly taking the lead in renewable energy development overseas, investing $32 billion – more than any other country. One example of the country’s foreign direct investment activity is the 244 megawatts’ worth of wind farms that the China Energy Investment Corporation is building in South Africa. In 2016, China initiated the G20 Green Finance Study Group, which facilitated a global consensus on developing green finance. Another initiative is the Green Investment Principles for the Belt and Road, a set of voluntary guidelines currently under development by a consortium of global-minded organizations led by the Green Finance Committee of the China Society for Finance and Banking and the Green Finance Initiative of City of London. Firstly, China should consider taking mandatory measures to enhance social responsibility in Chinese corporations. In past years, various Chinese government departments and industry associations issued voluntary guidelines for responsible overseas investment. To improve the effectiveness of these guidelines, we need to give them teeth. Some mandatory requirements are needed for responsible investment overseas. For example, the Ministry of Commerce can consider including a complete environmental impact assessment as part of its approval requirement for overseas investment projects. Secondly, “greening” investment and business operations in the Belt and Road will only happen through joint efforts from investors and recipients. Host countries should, therefore, create a conducive and stable environment for green investment. This requires countries along the Belt and Road to “green” their fiscal, regulatory and financial systems, including introducing more stringent environmental policies and their improving enforcement, making fiscal and taxation policies friendly to green business, developing green finance guidelines and products, and encouraging accounting for the entire lifecycle in the supply chain. Thirdly, underlining all of the above is the ability to design systems and develop instruments in government departments, financial institutions and corporations. Multilateral efforts are needed to support the development of platforms for sharing knowledge and experience in green investment. A good example of this type of capacity-building platform is the Global Green Finance Leadership Programme, hosted by the Centre for Finance and Development of Tsinghua University, the IFC-supported Sustainable Banking Network (SBN) and China Council for International Cooperation on Environment and Development (CCICED). At its launch event in May 2018, more than 120 government regulators and financial executives from 35 countries in the Belt and Road participated in a week of knowledge-sharing workshops in China. If we do well with the above, we believe the BRI will be a win-win solution for development and sustainability, and that China and other investing countries could make a great contribution to the green transition to sustainability in the countries along the ancient Silk Road. How can we realize the opportunities of China's Belt and Road strategy?